"Forty percent of mammal species are rodents, and they are found in vast numbers on all continents other than Antarctica. Common rodents include mice, rats, squirrels, chipmunks, gophers, porcupines, beavers, hamsters, gerbils, guinea pigs, degus, chinchillas, prairie dogs, and groundhogs. Rodents have sharp incisors that they use to gnaw wood, break into food, and bite predators. Most eat seeds or plants, though some have more varied diets. Some species have historically been pests, eating seeds stored by people and spreading disease . . . There are about 2,277 species of rodents . . . Their success is probably due to their small size, short breeding cycle, and ability to gnaw and eat a wide variety of foods . . ."
Rodents and other critters abound, just like they do in the woods close to our house in Virginia. The most common creature we see in the campground is squirrels. It's always fun to watch them scamper through the tree branches (except when they steal our ripe peaches at home!). Cody perks up when he hears them -- after all, it might be something else to chase. He learned long ago that he'll never catch a squirrel, so if he identifies one as the source of the noise, he just yawns and goes back to sleep. As summer wanes, the nights are getting cooler here at about 5,200 feet in elevation -- low 40s to low 50s F., which is refreshing for us and actually warmer than what we've had all summer in various mountain ranges at 9,000-10,000 feet. But these cooler temps are a clarion call for bugs and rodents to seek warmer, more hospitable digs for the approaching winter. If that means finding a nice, warm, dry house -- or camper -- that also has an acceptable food source, they are indeed happy creatures and they quickly make a nest. Home at last! Now Jim and I like little furry critters just as much as the next person. Maybe more. As a child growing up on a farm I used to play with baby mice in the corncrib, even baby garter snakes in the garden! I had some entertaining pet gerbils, hamsters, and guinea pigs (only one species at a time) when I was in my early 20s; they were usually in their cage but sometimes I'd let them loose to run around the house. They always came back to me eventually. Other than that, neither Jim nor I like sharing our living quarters with rodents, reptiles, or insects. Although many people have mice as pets, they can be dangerous to humans when they spread disease and exacerbate asthma problems. And, like other rodents, mice have been known to chew through old wiring, causing house fires. Once you've got 'em, you need to eradicate them one way or another ASAP. Female mice can have as many as eight litters per year, with four to seven "pups" per litter. Do the math. In 60+ years one or both of us has had our share of uninvited mice in basements, squirrels and birds in attics, and spiders, lady bugs, stink bugs, or other insects inside when the weather cools down in the autumn and winter. Most have gained entry through open doors or windows, not cracks or holes in the wall. Over the years we've both learned most of the ways to prevent pests from getting into a house. We've also used a variety of procedures to remove them, dead or alive, from shooing them out the door to traps to poisons. Each method of eradication has its limitations and ethical considerations. Our camper is another story. It has so many gaps in the walls and windows that it's practically a sieve, an open invitation to unwanted guests. The camper doesn't have an attic, thank goodness, so I don't think any birds or squirrels have ever taken up residence inside. But we have a good-sized basement with lots of nooks and crannies that make perfect hidden nesting sites for mice. This was before we started going to the Southwest for the winter; Jim had winterized the camper the previous fall and it had sat empty and un-entered in the back yard, surrounded by woods, for several months. It didn't take long to figure out that an extended family of mice was calling it home! Jim found several nests -- with rug fringe as one of the bedding materials -- in the camper basement. Even though there was no food inside the camper for them, it was warm and dry in the basement and they foraged outside for food. They are like little Houdinis the way they can climb up virtually any surface and reach the basement. Of course, they left us little presents inside on the carpeting that covers the basement floor. That's really what gave away their identity; they aren't trained like Cody (our Labrador retriever) to poop in the woods! It wasn't until Friday that we realized we had one or more mice inside. That morning Jim noticed something had taken a big bite out of a couple of peaches and pears that were sitting out in bowls on the kitchen counter. He showed me, and I immediately thought of those "coffee grounds" I'd cleaned up before he saw them. Oh, crap (so to speak). Those were obviously mouse droppings. Then we also noticed that a big chunk was gone from the end of the loaf of bread, too. Our guests were clearly carbo-loading. No one mouse could have possibly eaten all that food in one night. That lead to an all-out search through all the kitchen cabinets and drawers for more evidence of mice. Other than on the countertop, the only other places we found droppings inside the camper were under the gas burners on the stove top (which is under a loose metal cover) and in the drawer under the oven where I store pots and pans. The stove/oven unit must have been their entry point from the basement, where we also found some droppings. One of the recommended ways to prevent a mouse invasion is to keep food out of their reach. Since they can go nearly anywhere, that can be difficult and involve lots of containers with tight lids. Our mice haven't gotten into the pantry yet, nor any of the food cabinets above the counter, so we've kept the fresh fruit and bread in the pantry the last few days with success. That afternoon on a trip into town for supplies I went on a mission to find some effective method(s) of eradication. Wal-Mart's pest control shelves gave me an array of options from traps to poisons to sticky pads. Fortunately, I found a couple of options I'd never seen before that seemed less "messy" than the ones I've used before to get rid of mice. I have never in my life set or emptied a spring-loaded mouse trap -- and I never will. That option is just too gross for me. Jim and my ex always got that dirty job in the past, if they chose to use it for pest control. I hated it. For many years my method of choice to get rid of mice was D-Con, those little green pellets that rodents eat or hide in weird places. The chemicals cause the mice to bleed to death internally. Unfortunately, they are also deadly to other animals and children. Dogs find them as tasty as mice do, as we discovered when both Tater and Cody consumed an unknown quantity they found in the garage several years ago. The vet's diagnosis and Vitamin K treatment regimen served as a frightening, expensive lesson to us and we vowed to never, ever use D-Con or similar rat poisons again. Even if you don't have pets or children around, these pellets aren't such a great option. I've found them hidden in storage boxes in the basement and in other, stranger places. 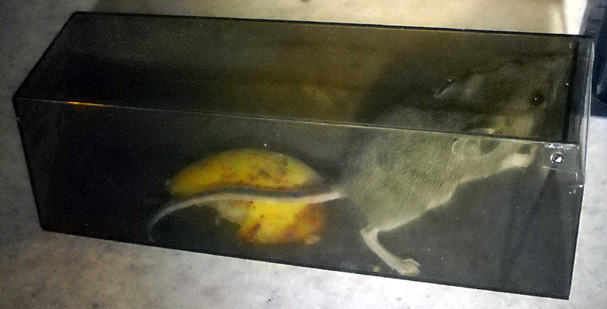 Mice are the original "pack rats," storing them in what they think is a safe place for later consumption. Worse yet, you don't know where you'll find the dead mice themselves. They probably won't stink like a starved squirrel in your wall or attic, but it's no fun finding their desiccated remains in unexpected places. Even before I went into Wal-Mart I knew I wouldn't be purchasing either of these two products. But what else is there to get rid of mice? 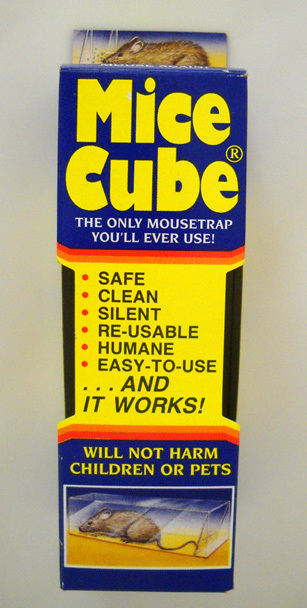 After looking at all the alternatives -- and there were a bunch -- I chose two products that were new to me: a type of sticky pad that you put along walls where mice run (Tomcat glue traps), and a Mice Cube (trademarked name). We loved one and hated the other. I try not to either endorse or trash products or businesses very often on this website because I don't particularly like commercial endorsements on other peoples' websites, but when I find one that I really think warrants mentioning, I'll do it. Just store this away for future use . . . cold weather is coming and you never know when you might get some uninvited guests in your home. Remember the grim (Grimm?) legend of the Pied Piper, who successfully rid a town of its rat infestation in the Middle Ages? Well, a clever company named Pied Piper International from New Castle, NH, makes a clever product that enables folks everywhere to be modern pied pipers and rid their abodes of mice in a clean, humane fashion. We can attest to the efficacy of the product and it's even made in the USA with good old New England ingenuity, simplicity, and economy -- only $1.56 plus tax at the Logan, UT Wal-Mart, cheaper than any other live trap I've seen. Each translucent gray plastic mousetrap is about 6" long by 2" high and wide. It has a light-weight door that swings in to let the mouse inside, but it will not swing back out. It is higher than the opening. The mouse enters by pushing the door inward to get to the food. The door closes by gravity, preventing escape. It is too big to close all the way and open outward. As the box says, it is simple, easy to use, clean, effective, safe for pets and children, humane for the mouse, and re-usable. And you don't even have to touch the mouse. We only dispute the "silent" claim. A determined mouse can rattle the cube around a little bit, but at least there aren't any mouse screams. Put some fruit or peanut butter inside to attract the mouse. There are little holes in the door so mice can smell the food. Place the trap along a wall or in an area where you've seen mouse activity or droppings. Go away. As you'll see, you don't even have to go very far away. After a mouse is caught, disposal is clean and simple. Take the trap outside and turn it upside down so the mouse can exit. Jim and I advise taking it as far away from your house or camper as you can walk in a reasonable time or it might come back! That's our Tip #1. I have to add something funny here. Jim had never seen a Mice Cube previously either, so he was reading the back of the box out loud when we got home. I heard him say, "Warning. Check trap once or twice a day, as mouse will explode if left in Mice Cube," and I busted out laughing. I had read the back of the box in the store, and I sure didn't remember anything about exploding mice. Explode??!! I envisioned swollen road kill that's been out in the heat for several days . . .
We both thought that was odd, however, since there are holes in the door of the Mice Cube for air to get in and out. I grabbed the box from Jim and reread the directions. 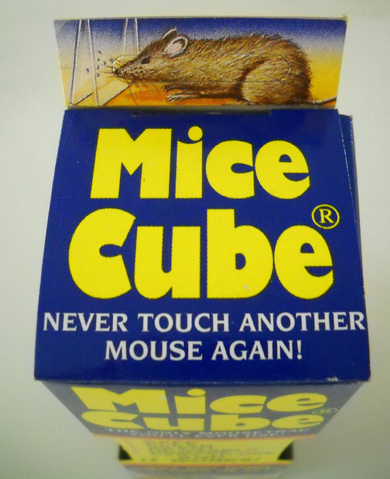 Instead of explode, the directions warn users that mice might expire in the cube! We got a good laugh out of Jim's inadvertent choice of words, not that a mouse would die if left too long in the cube. It shouldn't if it's removed within several hours. The Tomcat sticky pads aren't at all funny but they are definitely effective. The glue smells good to mice, insects, and spiders. 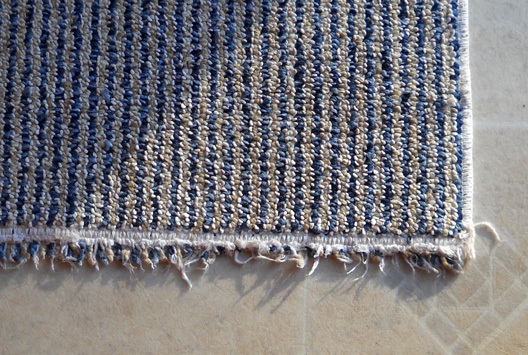 It is non-toxic to them, as well as pets and children. It is lethal, however, to any small creature that walks over the pad and gets its paws or feet stuck -- permanently stuck. They cannot get loose. It's a slow death sentence once you toss the trap and victim in the trash. You can't even pull them loose (and you wouldn't want to try that with a mouse with its sharp incisors anyway). After supper on Friday, the day we brought the Mice Cube and glue pads home, we washed the dishes and wiped up our limited counter space as usual. Jim had kept the partially-eaten peach and pear in baggies in the refrigerator as bait. 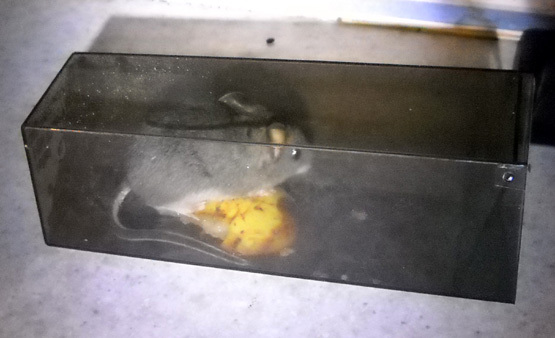 He cut off a little piece of fragrant Bartlett pear and placed it inside the Mice Cube. We arranged it and two of the flat glue traps on the counter along the wall under the kitchen window. This was the pathway the critters took from the range to the fruit bowls. We put the fruit bowls back on the counter, too, as added incentive. We didn't have long to wait, less than an hour. I was busy at my computer, with my back to the kitchen. Jim's seat at the table, where he was working on his laptop, faces the kitchen. A movement out of the corner of his eye caught his attention. Then he saw a little gray mouse scurry around between the fruit bowls. He told me to quietly turn around and watch. Soon I saw the mouse do the same thing again. Boy, did it move fast! And it sure was a cutie. We watched, trying not to giggle or talk, as the mouse sniffed the Mice Cube. We couldn't see it, but we could hear the door close. We got up quickly and found our first mouse inside the trap! We think it was a juvenile mouse, not an adult. Mmmm . . . pear! My favorite snack!! You can also see in the first two cube photos a tiny mouse dropping (pellet of poop) in the background! I didn't notice that until I cropped these pictures. Uh, oh. Maybe that wasn't the best move. We knew it wouldn't suffocate because of the holes in the door but we felt sorry for it and didn't see any need to make it suffer any longer than necessary. Jim took the cube and mouse outside and released it across the road. Later he would joke to friends that he let it out next to another camper but he assured me that he didn't really do that! Jim came back in and set up the Mice Cube in the same spot but we had no other kitchen visitors before we went to bed about 10 PM. We put away the bowls of fruit but left both kinds of traps in place. After we went to bed, the mice were having a heyday in the kitchen. I usually wear earplugs but didn't start out with them Friday night. Both Jim and I slept lightly, listening for another mouse to enter the cube. We knew there had to be more, but we had no idea how many more. We figured they'd be busy under the cover of darkness. Around midnight we heard enough of a noise in the kitchen for both of us to get up to check it out. Yep, there was another small mouse in the cube and he was literally bouncing off the walls inside, trying to get out. That's the noise we heard. So much for these traps being silent! The trap even moved a little bit on the counter. Jim was groggy and didn't take that one on as long of a trip outside as the first one. We don't know for sure, but it may well have come back. We were awakened again at 2:30 AM to even more of a racket in the kitchen. A bigger mouse rattling around, I thought. Poor Cody must have been going nuts with all the activity on the counter; I'm surprised he didn't bark at the mice. Yeah, mice plural, but we didn't know that until several hours later. Neither one of us wanted to take a long walk down the road at oh-dark-thirty to release another mouse, so we didn't go downstairs to see our catch. We tried to ignore it and go back to sleep. But even with earplugs I could still hear the commotion in the kitchen the rest of the night. When we got up about 7 AM we were totally amazed to find not only another little mouse in the cube, but also two larger ones (Mom and Dad?) stuck side by side on a nearby glue trap. That was FIVE mice total, unless one was a repeat offender that found its way back after Jim released it outside earlier that night. The mouse in the cube had been thrashing around so hard the plastic cube was steamed up, but at least he lived to tell his buddies about it. The two bigger mice would die lingering deaths. One was probably already dead; it wasn't moving and its mouth was stuck in the glue next to its front feet. The other one was still thrashing about on the sticky pad that had been moved several inches across the counter. We felt terrible as we watched his frantic efforts to free himself from the sticky ooze. Wow. No wonder there was so much racket during the night! Jim reached inside the cabinet under the kitchen sink to get the garbage bag; he planned to put the mice on the sticky pad in it. He was very surprised when a SIXTH mouse started jumping around inside the bag!! He quickly closed it so the mouse couldn't bite him or escape until later (that one lived). I got Jim another bag for the mice on the glue pad. He took both bags and the cube w/mouse down the road to the dumpster, releasing the two live mice and putting the two doomed ones in the trash. SATURDAY & SUNDAY: THIS IS ALL-OUT WAR! We were a bit shaken up by all this. Not only did we feel guilty about the fate of the mice stuck to the glue pad, we also worried about how many more mice we had and how we'd get rid of them. Should we buy more Mice Cubes, or does the bait just attract more mice (like happens when you use those Japanese beetle traps and all the beetles from the neighbors' yards come to your yard)? 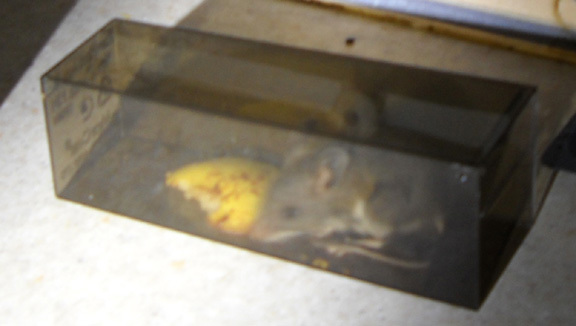 Did we get the mice here or in Leadville, where it was colder at night? 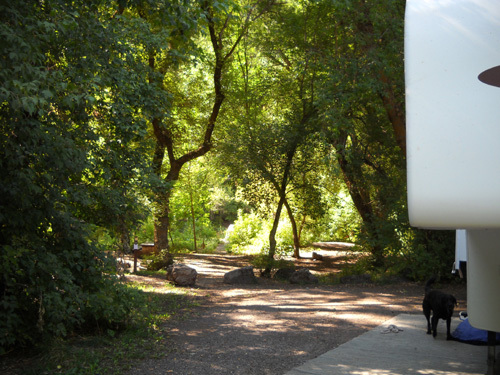 Should we move to another campsite or campground, or will we just take the mice with us? Was this apparent mouse family the only one nesting in the basement or are there more babies inside a pregnant mama who hasn't yet gotten caught? Among lots of other things, we pondered those questions and dilemmas yesterday while we ran on the Bear course. When we returned to the camper later in the afternoon we were almost afraid to go inside. How many more dead mice would we find? Fortunately, none. And there were no more last night. Hopefully, the carnage is over. The first is to stop using the glue pads; that's a cruel way for a mouse to die (unless it's carrying Hantavirus that can kill you). We vow to stop leaving fruit and bread out on the counter; so far, everything appears to be safe in the cabinets -- for now. We can store bread in the refrigerator, freezer, or microwave if mice ever get into the cabinets. We did find new droppings in the basement yesterday although there hasn't been any dog food they could get into. We'll continue to keep Cody's dog biscuits in a closed container and we can put his dry food in a container if mice find the bag in the outside storage cabinet where we keep it. Because of the mice droppings in the basement, we assumed there were one or more nests inside. We took everything out of the basement yesterday and found one nest hidden in a blind corner. Jim had to use a mirror to find it. The mice shredded paper from a roll of paper towels lying in the basement. We got rid of the nest, put the paper towels in a cabinet in the kitchen, vacuumed the carpet in the basement area, and put everything back inside. We had talked about moving into town on our last night, even before the mice invaded. There were several good reasons why it made sense; the Mouse War just clinched the decision. This morning we ran once more on the riverside trails (above) and hung out at Guinavah Campground until mid-afternoon. Check-out is a little earlier, but the weekend crowd had left and no one was clamoring for our spot. We drove the camper down to the Laundromat with free WiFi and parked nearby under a large shade tree to stay as cool as possible in the 90+ degree heat. It was nice to get online in the camper and be almost as close to the washers and dryers as we are in our house. When we got done with laundry we drove to the campground at the county fairgrounds to see if we could perhaps spend the night there. However, it was still packed for an event that was going on. We still had Plans B and C: our next stops were to pick up groceries and supplies at Sam's Club and the nearby Wal-Mart at the north end of Logan. All year we've been trying to decide whether to put four new tires on the camper. They will cost a bundle, but a smaller bundle at Wal-Mart or Sam's than most other places. Our first choice is Sam's Club because of their current no-interest deal if we pay off the tires in six months. Jim has determined that the Michelin light truck tires currently stocked by Sam's are suitable for our camper. They come with a nice rebate this summer, another incentive to buy now. We wanted to see if Sam's Club could install our tires on Monday morning before we left the Logan area. A couple other Sam's that Jim has talked to this year were willing to put them directly on the camper itself if we brought it in. This store, even though we were sitting right there in our camper, said they don't do it that way. Jim would have to take off each tire and wheel one at a time, take the wheel into the shop for them to put a new tire on, and then go back to the camper and put the wheel back on. Repeat three more times, one wheel at a time. Needless to say, the Logan Sam's Club lost that sale!! We got permission from the Sam's Club manager to stay overnight in the parking lot. This is an even better deal than on weekdays, because the store closes at 6 PM on Sundays (8:30 during the week) and is normally much quieter during the night than a Wal-Mart parking lot. Jim turned the TV up louder than usual to drown out the noise. The landscapers and their equipment have gone now, so we should have a cool, peaceful night of sleep. 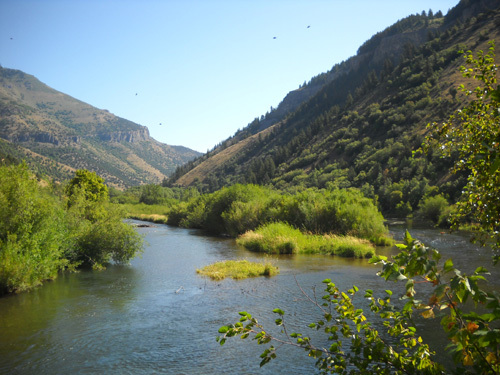 In the morning we'll head up through Logan Canyon to make our way to the Grand Teton races this Saturday. We'll be back here in a week to continue training for the Bear 100. Hopefully, it'll just be Jim, Cody, and me in the camper and we won't be providing room and board to any more mice on this trip!